When you buy a lemon, you generally want to ensure you’ll maximum the juice from it. It can be quite a disappointment to cut open a fruit,only to find it hard, a bit dry and difficult to extract the juice. 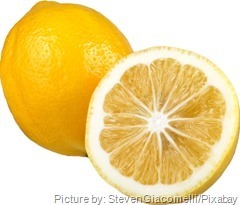 Lemons should have a beautiful deep yellow to their skin that indicates their ripeness. When the fruit ages, the skin colour becomes pale and wrinkled, and the juice inside will have started to dry out. The skin should have a smooth texture, without that dimpled feel that some lemons can have when you run your fingers over the surface. It should be firm in the hand, still give a little, but definitely not too soft – and appear heavier than it size suggests. If you’re only going to use the zest of the lemon, then choose unwaxed lemons, and go for a firmer fruit that has a thicker skin. Lemons can be stored on the counter top for about a week, depending on how old there were you when you bought them. Because they’re quite a decorative fruit, you could put a bowl of them in your lounge (out of direct sunlight) so that they fill the air with their fragrance and add something to your interior decor. However, if you want them to last longer, then store them in the refrigerator sealed in a plastic bag. A great tip for lemons you’ve bought in bulk but can’t use quick enough, is to juice them and then freeze the juice in an ice cube tray. That way you have ready available lemon juice for whenever you might need it. Before you juice your lemon, give it a firm roll on the counter top with the palm of your hand. Then cut it into half and squeeze it, you’ll maximise the juice from it this way.